Lowca is a relatively small village and civil parish close to the West Cumbrian coast with views of the Solway Firth, the Irish Sea, the Galloway hills and the Isle of Man. Until 1934 it formed part of the civil parish of Harrington. It was at this time that the much larger village of Harrington to the north was transferred to the Borough of Workington that Lowca attained its status as a civil parish. For much of the 19th and 20th Centuries Lowca was a hive of heavy industry, largely based upon coal extraction and iron production. The respected steam engine and locomotive manufacturers Tulk and Ley (later Fletcher, Jennings & Co.) were based at Lowca for many years. A number of coal mines were located at Lowca extracting much of its coal production from seams under the sea. 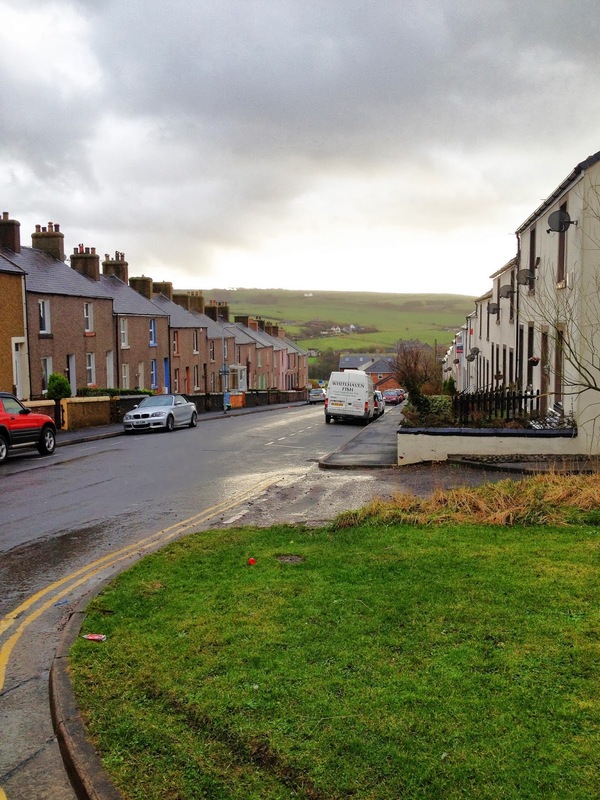 Many of the terraced houses built to house the miners and their families at Lowca can still be seen in the middle of the village [Photograph No. 1]. Shortly before the First World War, in 1911, a toluene chemical works was established at Lowca by the Workington Iron and Steel Company. Engineers from the German form of Koppers helped design and commission the tar plant. The Lowca works and the potential use of synthetic toluene out of benzene was well known to the Germans. Although Lowca is on the far N.W. coast of England, on 16 August 1915 the German submarine U-24 surfaced a little to the south of Lowca and began to shell the chemical works. To convince the Germans they had succeeded in destroying the plant, a valve operator, Mr Oscar Ohlson, released flaming gas into the atmosphere. It is believed the only casualty was a dog hit by a stray shell splinter. Many local people believed that a high-born German woman married to a former Member of Parliament for the local area (Whitehaven) was behind the attack and had been signalling the U-Boat from her nearby home. This high-born German woman was Mrs Hildegarde Burnyeat (née Retzlaff) had remained strongly pro-German after the declaration of war in 1914 and had alienated much of the local population because of this stance. Her husband, Mr William John Dalzell Burnyeat, M.A. (Liberal Party), had been Member of Parliament for Whitehaven between 1906 and 1910. Following this incident, Mrs Hildegarde Burnyeat was arrested under the Defence of the Realm Act. She was initially interned at Aylesbury prison, Buckinghamshire. William Burnyeat died the following year, while his wife was still imprisoned. She was subsequently released and lived with a British family in the spa town of Harrogate, Yorkshire. The Germans did not attack Lowca during WW2. However, the possibility of an attack was taken into account and appropriate plans made to counter-act such a venture. Firstly, there was a Home Guard platoon based at Lowca and secondly there were two Royal Artillery guns placed on the nearby cliff-top between Lowca and Whitehaven to the south (422nd Coast-Battery of the 561st Coast Regiment, Royal Artillery). Shortly after WW2, in 1946, most of the early footage of the Crown Film Unit's "Cumberland Story" was filmed at one of the Lowca collieries. "Cumberland Story" was directed by the celebrated wartime film director Humphrey Jennings, whose other films include "London Can Take It" and "Fires Were Started" (about the London Blitz), "The Silent Village" (about the wartime destruction of the Czech village of Lidice) and "The True Story of Lili Marlene" (about the wartime German song). Also in 1946, one of the miners working at Lowca No 11 colliery, Mr Tom Ritson, was selected to represent the Cumberland miners at the WW2 Victory March in London. At the time, Tom Ritson was the Branch Secretary of the miners union. He had also served in the Home Guard during the war. 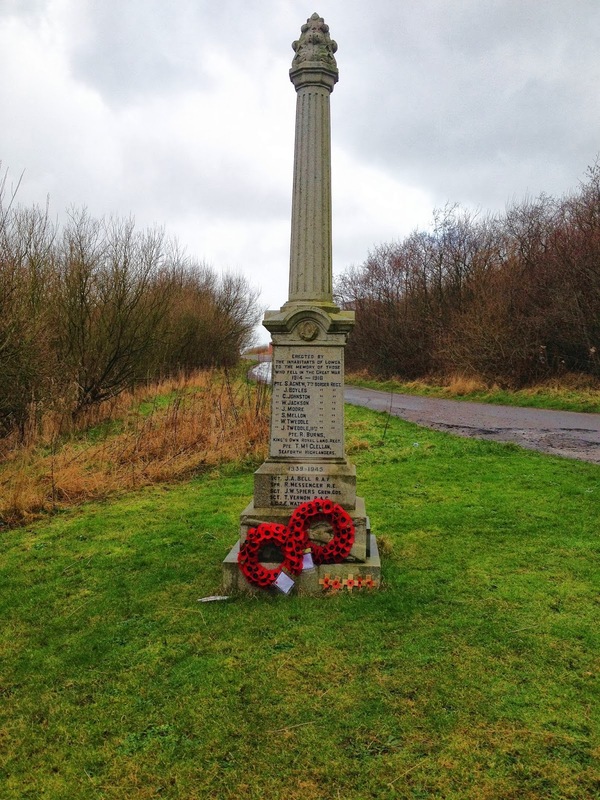 The remainder of this article deals mainly with the war memorial and those who are commemorated on it. 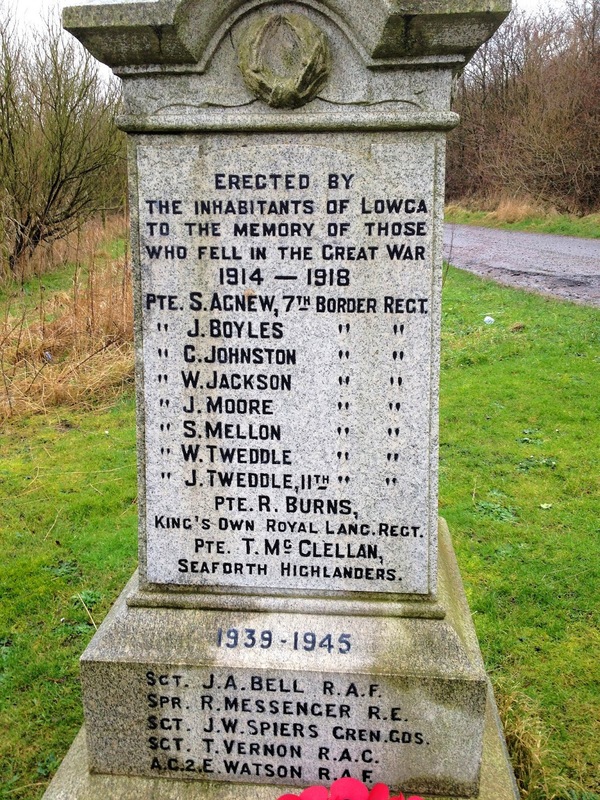 The Lowca village war memorial [Photograph No. 2] is situated close to the main road passing through the centre of the village. The names of the villagers who lost their lives in the First and Second World War are engraved on the front of the memorial [Photograph No. 3]. Until 2008, it as located near the Methodist chapel in the village when it was moved to its present site. This fact is recorded by a tablet on the plinth of the memorial [Photograph No. 4]. Pte. S. Agnew, 7th Border Regt. Pte. J. Boyles, 7th Border Regt. Pte. C. Johnston, 7th Border Regt. Pte. W. Jackson, 7th Border Regt. Pte. J. Moore, 7th Border Regt. Pte. S. Mellon, 7th Border Regt. Pte. W. Tweddle, 7th Border Regt. Pte. J. Tweddle, 11th Border Regt. Pte. R. Burns, King's Own Royal Lanc. Regt. Pte. T. McClellan, Seaforth Highlanders. Sgt. J.W. Spiers, Gren. Gds. 1. Sergeant Joseph Ashbridge BELL, R.A.F.V.R. Grave Reference: Row 6. Grave 11. Son of Joseph Ashbridge Bell and Georgina Bell, of Lowca. 2. Sapper Robinson MESSENGER, R.E. Regiment/Service: Royal Engineers, 501 Field Coy. Grave Reference: III, F, 6. Son of James and Annie Messenger, of Lowca, Cumberland. Regiment/Service: Grenadier Guards, 1st Bn. Grave Reference: 43. A. 3. Son of William and Sarah Spiers; husband of Elsie Spiers, of Prospect, Cumberland. 4. Lance Serjeant Thomas VERNON, R.A.C. 141st (7th Bn. The Buffs [Royal East Kent Regt.]) Regt. Grave Reference: I. D. 24. Husband of Nora Vernon, of Morpeth, Northumberland. 5. Leading Aircraftman Edward WATSON, R.A.F.V.R. Grave Reference: Row 5. Grave 3. Cemetery: DOWNHAM MARKET CEMETERY, Norfolk. Son of Edward and Elizabeth Ann Watson, of Seaton, Workington. Cumberland. Regiment/Service: Border Regiment, 7th Bn. Son of Annie Agnew, of 15, West Row, Lowca, Whitehaven, Cumberland, and the late James Agnew. Son of John and Mary Boyles, of 8, East Croft Terrace, Lowca, Whitehaven, Cumberland. Regiment/Service: Border Regiment, "C" Coy. 7th Bn. Son of Thomas and Jane Jackson, of 3, Meadow View, Lowca, Cumberland. Regiment/Service: Border Regiment, B "Coy". 7th (Westmorland and Cumberland) Bn. Son of John and Elizabeth Moore. Son of Richard Mellon, of Lowca, Whitehaven, Cumberland. Regiment/Service: King's Own (Royal Lancaster Regiment), 8th Bn. Grave Reference: XIII. D. 10. Grave Reference: III. G. 11. Regiment/Service: Border Regiment, 12th Bn. Grave Reference: In West part. Son of Ralph and Annie Whitehead, of Harrington Hill, Lowca, Whitehaven. 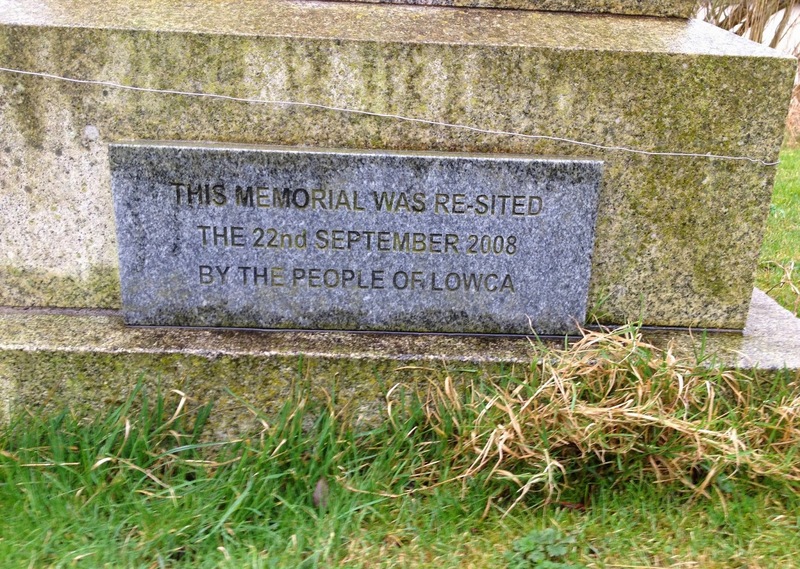 This article is dedicated to the memory of the villagers of Lowca who lost their lives in the two World Wars. Re Private George Edward Whitehead. Whitehaven News Thurs 5th Dec 1918: "Funeral of Lowca Soldier"
"Private George E Whitehead late of Green House Lowca was badly "gassed" in France and brought home to hospital. On his convalescence he was sent to work at Winngates Farm, Hutton Roof. There he fell victim to influenza and died on Saturday 16th November. His body was brought home to Lowca on Mon 9th November by motor car and interred on Thursday last in Moresby churchyard. A sergeant and six men of the Agricultural Company at Carlisle bore their comrade's body to its last resting place. A hymn was sung at the house before the cortege started, and also at the service in Moresby Church, during which a brief consolatory address was given on the Christ-like self sacrifice of those who have laid down their lives for us." NB the farm where he died is likely to be "Whin Yeats" - LA6 2PJ. The Whitehaven News for this period shows there was a serious influenza epidemic reporting on the same page: "More deaths from the epidemic at Egremont. - The grim hand of the Reaper continues to claim toll, young, old and middle aged alike being called." This may be the reason why George's name doesn't appear on the war memorial as he didn't die in battle or from obvious wounds. The fact that he had been badly gassed however is likely to have contributed to his death and the funeral address suggests others shared this view.